Only three of the many possible products resulting from the chlorination of benzene continue to have any large-volume applications—monochlorobenzene, o-dichlorobenzene, and p-dichlorobenzene—combined they account for about 98% of the total chlorobenzenes market. Other chlorobenzenes that have commercial applications but are not produced on a large scale include m-dichlorobenzene, trichlorobenzenes, tetrachlorobenzenes, and hexachlorobenzene. Market information on these products is included in the report where available. Monochlorobenzene accounted for about 64% of total chlorobenzene consumption in the five major regions shown above. China is the world’s largest manufacturer and consumer, accounting for nearly two-thirds of total consumption in these regions. Monochlorobenzene represents about 70% of chlorobenzene consumption in Western Europe, 62% in India, and 51% of consumption in the United States, but only 8% in Japan, where p-dichlorobenzene is a larger factor than in the other regions. Nitrochlorobenzene is the most significant end use for monochlorobenzene. Nitrochlorobenzenes are consumed as intermediates in the manufacture of dyes and pigments, rubber-processing chemicals, pesticides, pharmaceuticals, and other organic chemicals. o-Dichlorobenzene is a chemical intermediate consumed mostly for 3,4-dichloroaniline in the United States, South America, and Western Europe, as an herbicide intermediate in Japan, and for pesticides and pharmaceuticals in China and India. Worldwide, p-dichlorobenzene is used primarily as a raw material for polyphenylene sulfide (PPS) resins, for deodorant blocks for indoor air, and for moth control. Polyphenylene sulfide is a growing high-performance engineering resin that is produced only in the United States, Japan, China, and since mid-2016, South Korea. There are no producers of PPS resins in Western Europe. PPS resin production has increased rapidly both in the United States and Japan over the past 10 years, and has become significant in China since 2010. PPS production is projected to continue to grow over the next five years, with additional capacity planned in China and South Korea. Use for moth control (replacing naphthalene-based mothballs) and room deodorants is the largest market in China and the rest of the world. The gradual shift in global demand away from industrialized regions and further into developing countries has resulted in a buildup of new chlorobenzene capacity in Asia. China is the world’s most diverse market, with about two-thirds of global capacity and home to four of the world’s five largest producers. With the exception of high-performance polymers, the markets for chlorobenzenes are mature. 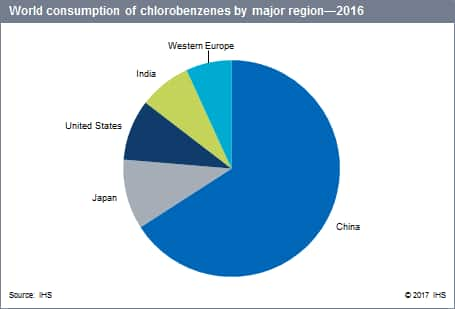 Demand for chlorobenzenes in more industrialized regions has been on the decline for the past few decades as a result of the substitution of alternative chemistry in the production of such products as phenol, rubber chemicals, and moth control agents. Growing environmental concern over usage of herbicides and chlorinated solvents has additionally contributed to the slow decline. However, strong growth in China and growing global demand for p-dichlorobenzene have since stabilized this trend, resulting in a moderate, average growth rate of about 4% per year for the forecast period.